I'll admit it: I'm a Compressor fanboy. Now that it's all grown up to Version 3, it's more useful than cootie repelant at a Miley Cyrus concert. It can package your movie into any one (or more) of a dozen plus formats (including FLV if you have Flash installed), or your audio into MP3, AC3 and Dolby Digital. While it's a super-easy program to use, it's simple interface belies the power beneath. Apple has thoughtfully included a number of workflow enhancements that make your life esier--once you know about them, that is. One of my favorite features is the ability to save compression presets. Compressor comes pre-populated with a number of useful presets for a wide variety of workflows. But after some playing around, I came up with one that worked really well for creating videos in the right format for ProPresenter. I like h.264 for my codec, and I tested various data rates to come up with a high quality image. I set up various other settings like de-interlacing and progressive scanning, frame sizes and audio settings. After I was done, I saved it as my ProPresenter preset and I'm done. You can come up with presets for a wide variety of formats, then apply them with one-click ease. Now, once a video is completed in Final Cut Pro, I select Export via Compressor from the File menu. FCP creates a temporary reference movie of the video and imports it as a new project in Compressor. I drag my ProPresenter setting on the clip, change the filename and destination and hit submit. In all, it takes under 30 seconds, and my videos come out in the looking great in the right format every time. Now that I have my preset worked out, I can send that preset file to anyone who may be creating videos for us. As many of our volunteers are using Final Cut, they drag the settings file into their Custom list, and their videos will match my specs exactly. Another little trick I've been using more and more is the Droplet. Kudos to Dave Smith at Creative Ideas for Twittering about this some time ago. I don't use Droplets as much as I use presets, but I value them nonetheless. A droplet is essentially an icon version of your setting that you can drop a video on. The droplet launches Batch Monitor, which will compress your video using the settings in your Droplet. Creating is one is a piece of cake. 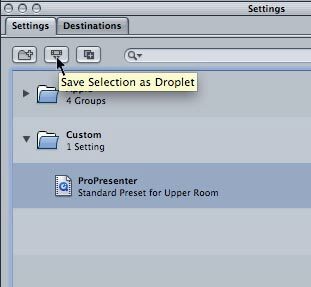 Simply select the preset you wish to Droplet-ize (I just made that up), and select the obscure icon for "Save Selection as Droplet"
Drag a video onto the Droplet and, bingo, up pops Batch Monitor, ready to do your compression. When it's done, it goes away, and you have your newly compressed file ready and waiting. Droplets are very useful if you receive a file in a format that doesn't fit your intended need. I use them as part of my archiving workflow. Every few months, I create a DVD of our recent video projects. 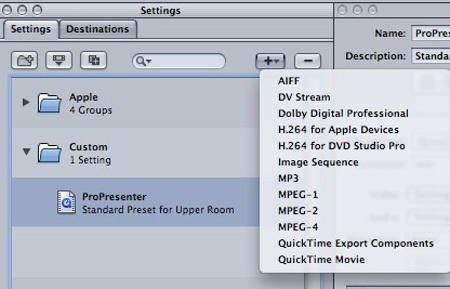 Since I play my files out as h.246s, they need to be converted to MPG2/AC3 streams for DVD Studio Pro. If I have the source files still on the system, I can simply run the videos back through Compressor and create the DVD files. But often I don't, so I simply drag my archived h.264 copy onto my DVD Droplet and bust out the MPG2. If I have a bunch to do (which I normally do), I drag them all in and let it go to work. One could argue that it's another trip through a compression engine and quality suffers, but h.264 videos look so good to start with, they convert to MPG2's pretty well, especially at high bit-rates. 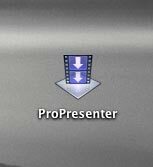 I also have a ProPresenter Droplet on my Desktop for transcoding files that come in from outside editors (who have not yet adopted my specs). So there you go. Another couple of time-saving tips brought to you by a guy who eats the same thing for breakfast every morning just so I don't have to waste time trying to decide what to eat.